A professional sports highlight video of your athletic talents (or dance or musical or acting performances) can be the capstone of a successful high school career. A sports or performance recruiting video can be the launching pad for college sports recruiters or college transfers. Our clients have gone on to UCLA, USC, Notre Dame, UVa., Villanova, New York University, Biola and beyond! Each project is delivered on DVD as well as being posted to the web. You receive a link to the game film which can be forwarded to coaches, friends and family. We do not charge additional fees for web hosting. Attention actors: In addition to sports highlight reels, we also help create actor "showreels" and actor demo reels putting together your best on-screen performances for web viewing or DVD. 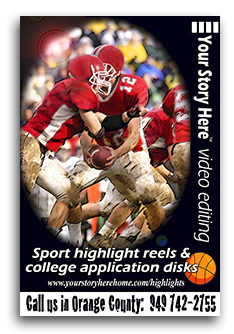 We have made highlight reels for football, dance, volleyball, soccer, basketball, track & more! Some highlight disks are for college applications & transfers, some for websites, & some for family. Highlight videos can be a whole lot more than just a string of random plays. We like to add player stats - and some sizzle. You're the student-athlete - you've done the work - let us help you make the most of your sporting achievements. Whatever the sport or activity, a sports highlight video, sports recruiting video or highlight reel (published to DVD and the web) can showcase your talents. Our stunning and affordable sports (or music/dance) highlight videos are appropriate for coach review for college applications, scholarships, college transfers; as a graduation present; or as an historical keepsake. Sports highlight video, sports recruiting video, and highlight reels in Orange County, California. Features include: tracking "spotlight" effect to highlight the athlete, TV-quality game captions, player stats, cool transitions and background music. 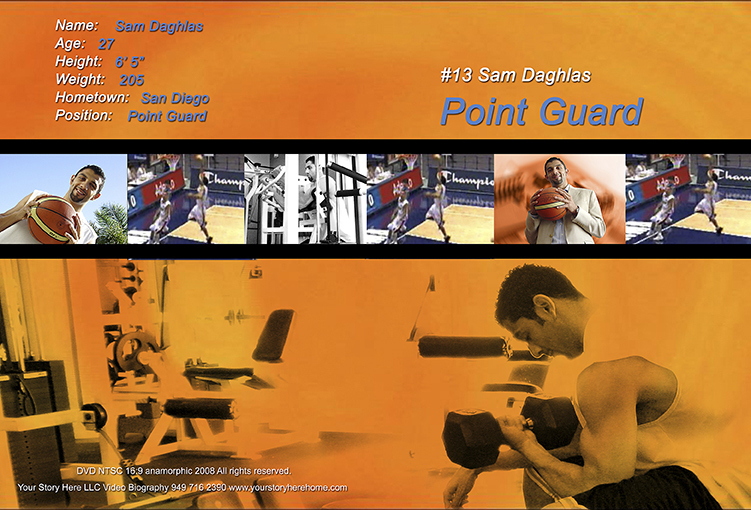 We also post sports highlight video to the web. 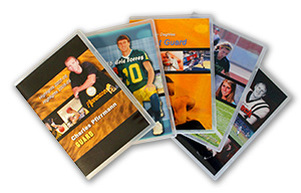 Each sports highlight reel or sports recruiting video comes with an eye-popping custom designed DVD box (samples above) and disk label that will command attention and help ensure that you stand out from the crowd. Give yourself the edge and celebrate excellence - call us about a sports recruiting video today. Offering sports, music, dance and performance highlight video in Orange County and the following communities: Foothill Ranch; Trabuco Canyon; Rancho Santa Margarita; Lake Forest; Mission Viejo; Ladera Ranch; Irvine; Laguna Hills; Dove Canyon; Laguna Beach; Dana Point; San Juan Capistrano; San Clemente; Laguna Niguel; Newport Beach; Costa Mesa; Huntington Beach; Fountain Valley; Seal Beach; Tustin; Tustin Ranch; Anaheim; Santa Ana; Orange; Aliso Viejo; Los Alamitos; Fullerton; Brea; Buena Park; Corona Del Mar. Also serving Los Angeles County; Long Beach; California; the USA - and the virtual world - by arrangement. If you are looking to put together a sports highlight video, a music or dance compilation, or a college recruiting tape, then start with good video. The editing process can improve a lot of things, but the better the images, the better your show reel and the better your chance at an athletic scholarship. There are three phases to creating an effective sports highlight reel. The first is to capture good video. The second is to select the best plays. And the third is to compile the material in your video editing program in the most effective way possible. This article tells you how to shoot the best sports video possible. Now, you may not be able to tick the box on every one of the following tips, but do as much as you can and you will be more than happy with the results. 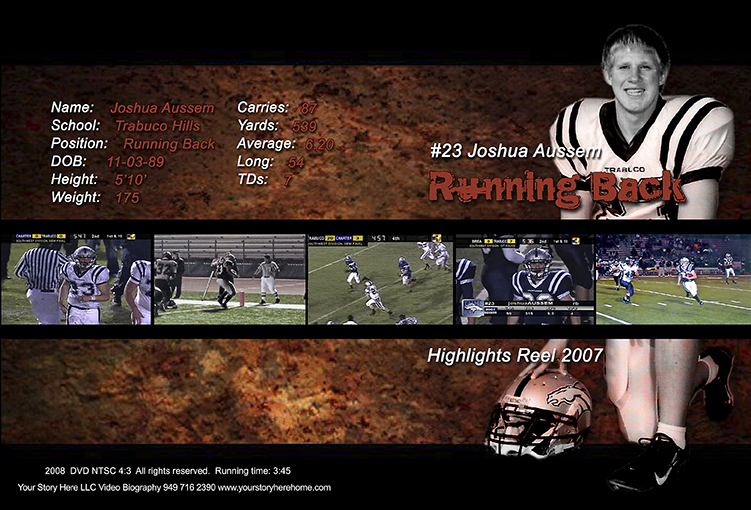 Once compiled - with music, captions (showing the game information), transitions, and spotlight effects (to ensure that the featured player stands out) - a sports recruiting video can be output to DVD, flash drive or uploaded to the web. If you plan to make a DVD, it's also a good idea to put together a handsome DVD box cover so that the sports highlight disk is not lost among all the other stray disks that seem to accumulate on coaches busy desks! So, let's go! Before you shoot, it's a good idea to look at some pro footage relevant to your sport. Between TV, cable and YouTube, you should be able to find your particular sport. Since you are going to be doing the filming, look at it from the point of view of the camera operator. What kind of framing did they use? What was their point of interest at the start of each play? How did they mix it up? It's also a good idea to review a fully edited sports highlight video - to get an idea of how long each play is typically featured on a highlight disk and to see how the final product fits together. The better the camera - the better the pictures. What is a really good video camera? Leaving aside the kind of pro-gear that ESPN uses, a good video camera will have 3 CCDs (charge couple devices) - each one capturing image information from either the red, green or blue color channels. Capturing each color on a separate CCD gives better color separation and a much clearer picture. A good camera will also have a generous optical zoom - 10X or 12X is sufficient for pretty much most amateur sports - but 20X is nice to have. But don't confuse optical zoom with digital zoom. Optical zoom will deliver clear pictures at the maximum extension. Digital zoom beyond the limit of the video camera's optical zoom will simply interpolate (read "invent") pixels to give you the illusion of increased detail. Most pros keep their digital zoom off at all times. High Definition? Sure, nice to have - but the massive size of the video files you create may gum up the works when you come to edit. Editing in HD brings its own peculiar challenges that really demand the fastest computers and largest hard disks. Not everyone can play Blu-ray disks on their home equipment yet. And as far as recruiting videos and athletic scholarships are concerned (and this may change in the future) it is still safer to avoid HD and send a standard definition DVD. Don't get too hung up on tracking down that distant cousin who shoots weddings and has a nice new "prosumer" camera. Almost any modern video camera will do the job for you - provided you know how it works! Digital storage that the newer video cameras feature is almost always great; and miniDV tapes work fine. But avoid recording in or outputting to old, analog, and low resolution formats. If using digital tapes in shooting your sports video, always use new tapes. And record in "SP" (short play) mode. Sure, you may need to change tapes during the game, but you will be more than rewarded with higher quality pictures. For most sports, you should be able to take up a position in the stands. For a day game, make sure the sun is behind you. Usually, the best spot is around the center line - nice and high up. If you have the luxury of filming a player who sees plenty of action, then you may want to vary your position (either during the game or in another game). Shoot some film from the sideline and maybe some from one end (depending on the sport of course). When you come to edit your highlight reel, it is always nice to have a selection of shot angles. Modern video cameras have remarkable low-light capabilities. You should have no trouble if you want to record sports highlights at indoor fixtures or even at night games or on gloomy days. Sunny days are fine for shooting sports too. But keep in mind that in the middle of the day the sun will create strong shadows and bright highlights - and no video camera can capture the whole full-sun tonal range that our eyes just take for granted. That means that you will probably lose some detail (particularly in the players' faces) when shooting video in the middle of a sunny day. You need a tripod. A tripod ensures a steady, un-jumpy shot and a nice, level picture. You level the video camera by looking at the view finder and lining up the top of the frame with the horizon - or some other level object in the background; then adjust leg lengths (a good tripod will have a little spirit level in its base). Some cameras have a "steady shot" function that can compensate for a shaky picture. But it does not work nearly as well as a tripod and you should turn it off when you have a tripod. Tripods are cheap and all the obvious stores sell them (even Staples has one suitable for a video camera for $25). You can never predict when that magic play is going to happen - so record the whole game while your player is on the field. In most cases, you will want to record a whole bunch of games to give you the widest possible selection of plays to include in your highlight reel or college recruiting video. Auto focus makes pros of us all. But the risk of using auto focus when shooting sports from the bleachers is that people stand up in front of the video camera or they move down rows in front of you and your camera auto adjusts to bring them into focus - like you care! So, if possible, lock your focus this way: switch to auto focus and point towards the center of the field or the court; then zoom in and allow the focus to adjust - then turn auto focus off. The video camera should stay focused on that distance for the whole game. If you are shooting close up - say you are now on the sidelines - then the action will probably be changing rapidly and you are safer to stay on auto-focus settings. Different light sources have different color temperatures. Depending on your video camera settings, natural light can appear blue, florescent lights can throw a green cast, and indoor stadium lights can look yellow. Sports highlight videos are sometimes compromised by an improper color cast - the most common one is a yellow tinge from indoor lights. Most video cameras allow you to "white balance" the camera to avoid these color cast issues. You point the camera at a white object in your field of shooting, zoom in to fill the viewfinder, press a button and the camera adjusts itself to render the colors of the game properly. Most cameras also allow you to choose a "white balance" setting - by selecting the sun, clouds, or indoor light icon. When shooting a whole sport outside, if you expect that light conditions may change (e.g. clouds drifting across the sun) then it is safest to use the auto setting. The best audio is captured from the sidelines. We have all seen those fancy audio dishes that ESPN uses to isolate player sound and impact noises, especially at football games. Shooting (and recording audio) from the stands means you will get a lot of crowd noise but not a lot of field noise. What can you do to improve audio? You could run a separate camera from the sideline and use it for audio - then combine that audio with the video from your camera in the bleaches when you come to edit. Or, you could buy a cheap "shotgun" mic., hook it up to the mic. jack on your camera, and point it towards the play - cutting out a lot of the crowd noise either side. But in most cases, these suggestions will be more trouble than they're worth. It never hurts to get some additional shots of the day - like a short interview with the player before or after the game, or a shot of the outside of the venue (called an "establishment shot" in the trade), or a shot of the score board or the team supporters (crowd, mascot, cheerleaders, band, etc). If you are planning on making a college recruiting tape, then you will use these additional shots very sparingly since coaches do not want their time wasted with endless "beauty" shots. 12. Finally, check your footage early! And, once the game is over, flip the protection tab (if using tapes) so you cannot record over - and mark the tape with the details of the day and the game. By following these 12 tips and with a little planning, we can all shoot excellent video footage that can become the foundation of an arresting sports highlight video or college recruiting disk. Good luck!